The thought of eating alligator is scary to some people, as they’d rather eat animals that they don’t fear will kill them when they’re alive. But the reality is that alligator is a very delicious meat that is a common source of protein in many societies (including some in the American south). 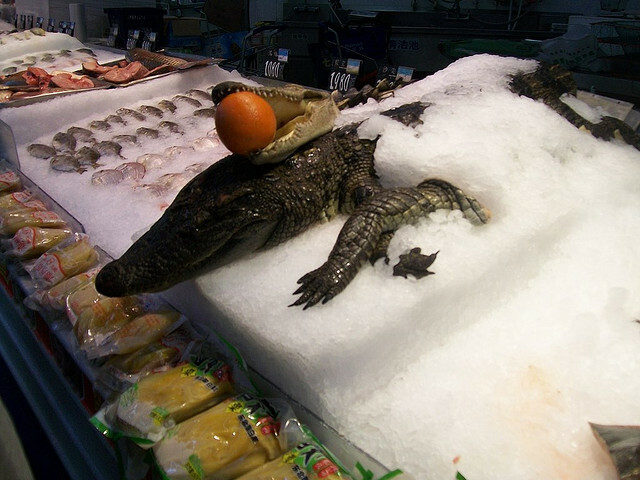 Alligator offers two very distinct meats: the tail (white and light) and the body (dark and strong). The flavor is strongly influenced by the alligator’s diet, but regardless of what the creature has been eating, many people are enamored with its tasty meat. In America, ostrich meat is most commonly seen in burgers. But meat lovers say that this is a waste of a delicious meat. Unlike most birds, ostrich meat is more similar in flavor to beef than to poultry. However, it dries out easily, which is why exotic-meat connoisseurs recommend that you cook it like you would a steak, not a burger. Snake is an incredibly popular meat in China and is also often enjoyed in the American southwest. The Chinese love eating exotic animals, and they believe that eating snakes helps them attain magical and spiritual strength, as well as improved sexual drive. All sorts of varieties are consumed, from small delicate snakes to huge pythons. Wild boar may win the award for ugliest animal that tastes delicious. Wild boar meat doesn’t actually taste much like pork; it is much more flavorful because it reflects the wild animals’ diet, which often primarily consists of fruit and nuts. As a result, wild boar is extremely rich and often sweet. You can find it at a lot of fancy restaurants in America, so keep your eye open; it is delicious! It is understandable that a lot of people are hesitant to eat cockroaches. But those who do eat them claim that the bugs are tasty at best, flavorless at worst. They are also a staple of many culture’s diets. Many people also believe that eating cockroaches can help solve the world’s hunger problem because they can be farmed with virtually any diet, and they pack absurd amounts of protein into a tiny body. These are just some of the many bizarre, unique, and fascinating meats that are consumed around the world. Vincent Batch, a freelancer based on Cincinnati, Ohio, writes on global cuisine, coffee, professional meat grinders, cooking shows, baking lessons, BBQ secrets and other related topics. Image credit goes to Bridget O’Donnell. Superbug Bacteria Increasing in Meats: Should You Be Concerned?